Non-Returnable POD (print on demand) vs. Returnable Traditional Inventory. 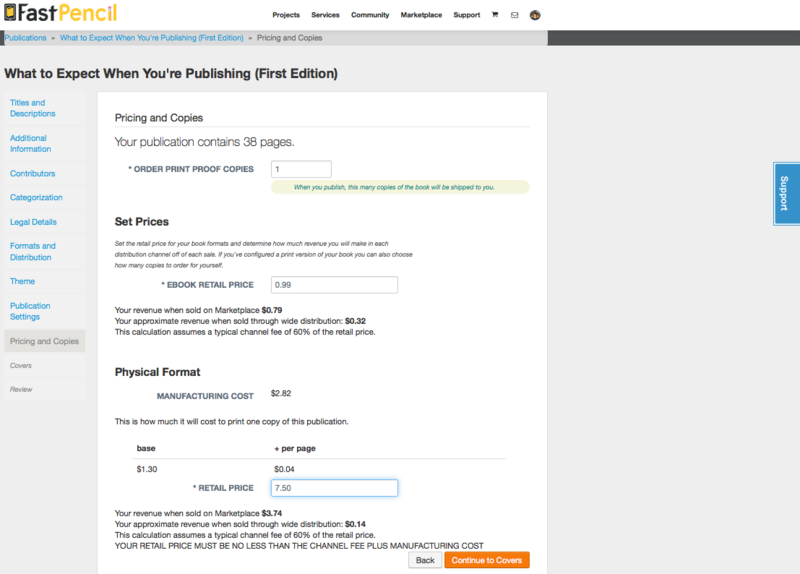 To change your book project’s price, go to your dashboard and click “Publication Setup”. Then, follow the publishing wizard tabs through PRICING and save your changes. Figuring out how to price your book can be tricky. Choose a price that is competitive, yet retail-channel friendly. Find out which books are most like yours and sample the market. Use similarities between genre, format, and page count as a guide to competitive pricing. Drive sales towards higher payouts. The profit margin for Book Sales on the FastPencil Marketplace is higher because there are no additional "channel fees". Royalties are split net profit 80%-author / 20%-FastPencil, so Authors are driving customers towards the BookBuy page. If a physical/print-on-demand book is sold for $10, and the manufacturing cost is $2, FastPencil splits the remaining $8, 80%/20%; the author makes $6.40 and FastPencil makes $1.60. If the e-book is sold for $10, the author makes $8 and FP makes $2. On a 3rd party Marketplace, channel fees do apply, and FastPencil would split the net profit 80%-author / 20%-FastPencil. For example, on Amazon.com, channel fees vary. But let’s say they charge 60% of the retail cost as a channel fee. If a physical/print-on-demand book is sold for $10, the channel fee is $6 and the manufacturing cost is $2, FastPencil splits the remaining $2, 80/20; the author makes $1.60 and FastPencil makes $0.40. If the e-book is sold for $10, the channel fee is $6, we split the remaining $4 80/20; the author makes $3.20 and FastPencil makes $0.80. FastPencil ensures authors will not price their book so low as to make a negative royalty. So be sure to go through your project’s Setup Publication button to see what a realistic price range for your book would be. Please note: The above illustration only showcases the revenue model for when books are sold to readers or distributors. Author pricing is different and is reflected on your publication’s page when you are signed into FastPencil. You/the author pays a discounted price for print books and would not earn royalties on this type of purchase. FastPencil sells non-returnable, POD (printed on demand) books. When a book is ordered, it is printed and shipped to the buyer. Using this method, the author/publisher does not have to pay for or store a large inventory of books. Paperback books are typically printed and bound within 5 business days. Hardcover books usually take 7-10 business days to print and bind. Alternatively, for returnable inventory sales, an order for a bulk buy (2,000+) and warehousing and fulfillment costs could be paid for by the author/publisher. However, this could result in unsold inventory, insurance fees, returned books that are lost or damaged and numerous other risks. The industry is moving away from this resource-heavy model and toward a greener, more earth-friendly process. Check out more information about our global, resource-saving Green Initiatives. Prioritize within each stage of the self-publishing lifecycle. Ask yourself: BUDGET or TIMELINE comes first at this point in the process? When you think you’re ready to publish, consider publishing privately first so that you can hold in your hands a for-your-eyes-only proof copy before Wide Distribution Fees dent the budget. Haste makes waste. Typos and errors are often found after publishing, so review your personal copy carefully. We suggest you MARK UP the physical copy (YES ~ Write in the BOOK with #RedPen, #AmEditing), pass it around, and publish your best work. If you don’t have to, don’t rush the process. Fast work costs more in the long run. Update your FastPencil Project after you’ve had at least 3 rounds of editing. Preview your revised proof in Digital PDF Format. Publish to the FastPencil Marketplace plus Wide Distribution. If your publishing date depends on a product launch or event appearance, ensure your books are in-hand with this general guideline for steps of the self-publishing lifecycle. Start with a publication date and work your schedule backward, or start with your event date and plan accordingly. FastPencil ensures books are built to perfect specifications – printed on demand – upon order and allows Hobbyists, Authors, and Publishers to Print and Publish books and e-books. With a global distribution network and easy to use book-building software, print and publishing professionals are selling books to wider audiences while earning more — 80% net royalties are paid to the published author.